The Helander Metal Spinning Company Library is an ever-evolving, free resource center for eBooks, whitepapers, and other informational texts about metal spinning, hydroforming, and other key metal forming processes. 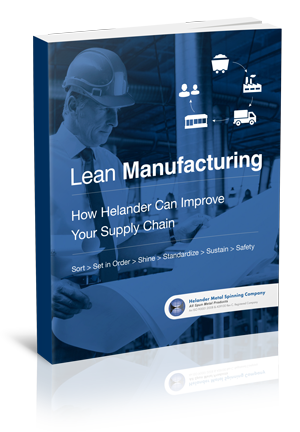 An inside guide to implementing lean manufacturing practices at your facility, this eBook explores the 5 components essential to workplace organization — plus the extra element that Helander implemented to take their facility one step further. Have you ever wondered about the differences and similarities are between metal spinning and hydroforming? From this eBook, you’ll learn valuable information about each of these processes, plus much more! The eBook, “Metal Spinning = Cost Effective Metal Forming” is a comprehensive guide to integrating alternative process plans in order to reap the cost benefits of using alternative methods for production — especially metal spinning. Our new, free eBook offering, “Hand Spinning and CNC Spinning,” provides a deeper understanding of the differences, similarities, and advantages of utilizing hand spinning and CNC spinning. Looking to work with Helander Metal Spinning Company? Here are all the facts in one place. We know that you’re busy, so we’ve taken “Look for a Quality Metal Spinner” off of your to-do list. This detailed eBook, “Hydroforming Magnetic/Rotary Pumps,” takes you through all the important benefits of hydroforming when it comes to manufacturing magnetic rotary pump as well as other products. We want to make your experience learning about some of our past projects as easy as possible, so we’ve compiled all of our portfolios into a single document. Helander Metal Spinning has put together our newest eBook, “5 Metal Spun and Hydroformed items that Required Surface Finishing,” to give you an idea of the range of items we have worked on that effortlessly combine functionality and aesthetics.